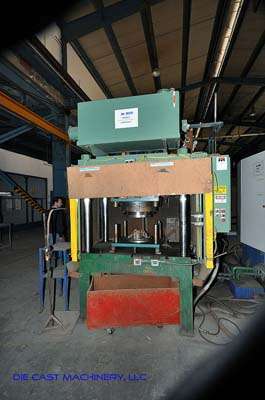 For Sale: One - Used - Second Hand - Metal Mechanics 50 Ton Four Post Vertical Trim Press. Inventory item: DCM-2723. One Used (Second Hand) Metal Mechanics 50 ton, four post hydraulic vertical die cast trimming press, Serial Number 2684, New 08-05, Cell number 1. Die Cast Machinery, LLC Inventory Number 2723.